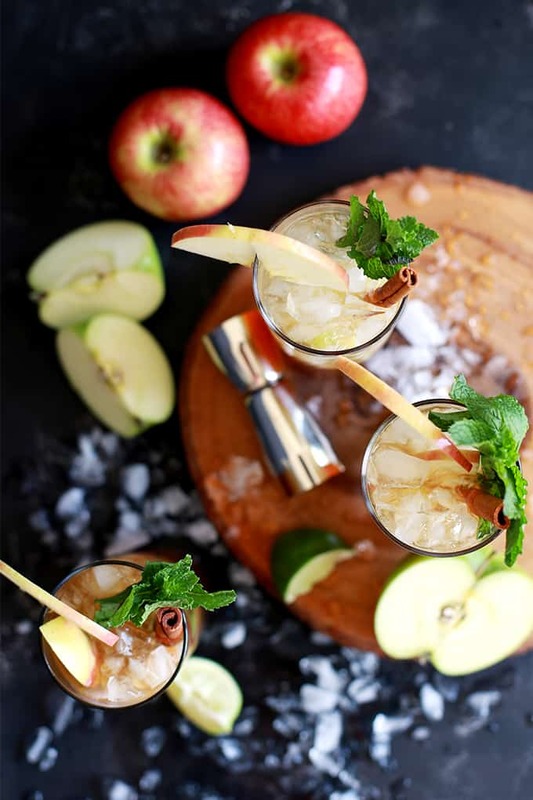 Your fall simply won’t be complete without an Apple Cider Mojito or two. It’s like a caramel apple in cocktail form. Perfect for an Indian Summer day when you’re looking for a refreshing drink, but with all the flavors of autumn. This Apple Cider Mojito recipe is what I like to call, the perfect marriage of leftovers. My husband had used apple cider in one of his barbecue concoctions and a half jug of it remained in the fridge when I began my weekly clean out. I also had mint begging to be used in my pots outside. The last two summers I’ve planted four plants so I wouldn’t have to buy any whenever I was in the mood to make mojitos. It’s a solid plan, my friends. So is this cocktail. I’m calling this the perfect Indian Summer cocktail. It’s still warm outside but you’re craving the warm and comforting tastes of fall. 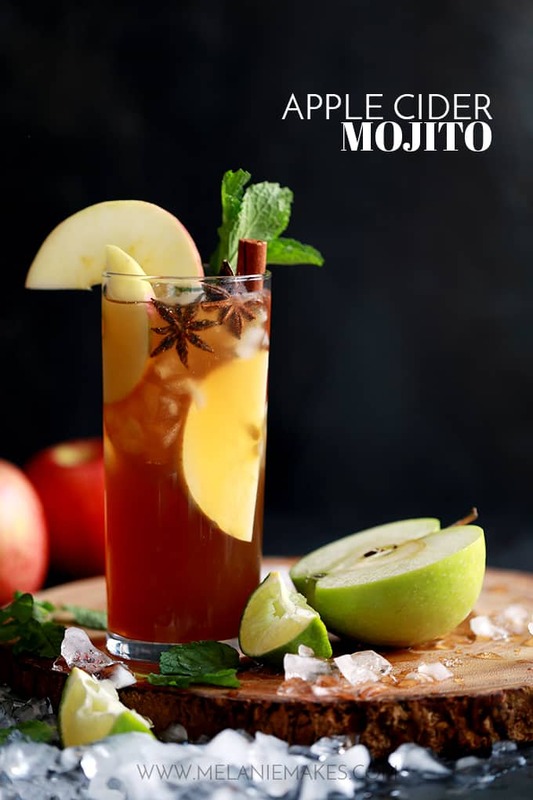 You definitely find it in this refreshing iced Apple Cider Mojito. There is absolutely no reason why this cocktail should work. None. Mint and apple cider? I mean, what rational mind thinks that they’re a perfect marriage? Me neither. But rest assured, they absolutely do. It’s like a caramel apple in cocktail form. And I’m betting the reason it works so well is my Brown Sugar Simple Syrup. 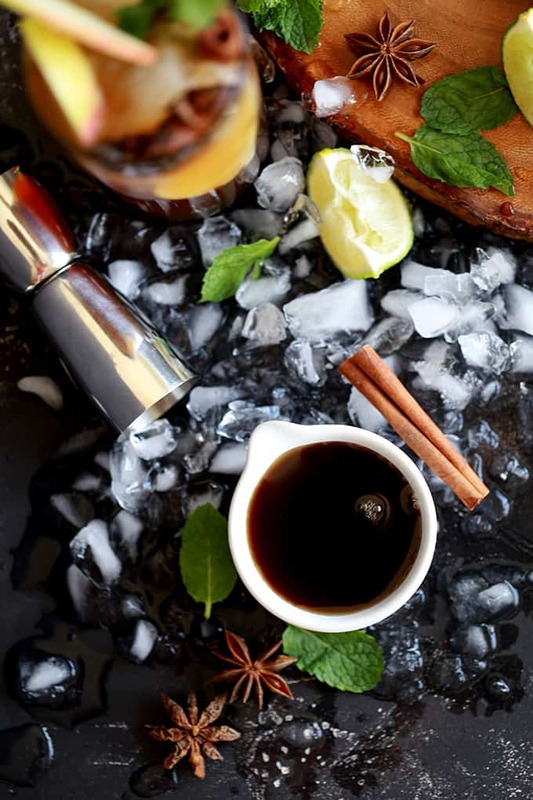 Typically I use a basic simple syrup in my mojito recipes. My Grapefruit Mojitos, Pineapple Mojitos and Peach Prosecco Mojitos all do. A simple syrup is nothing more than a solution of water and sugar made by heating them both together on the stovetop. Sure you can also purchase it off a store shelf, but it’s so easy, why would you want to? Besides simple syrup, a mojito typically includes rum, lime juice and fresh mint. But my Apple Cider Mojito calls for something a bit different. A bit warmer, if you will. Instead of the traditionally used white sugar, I substituted brown sugar to create this Brown Sugar Simple Syrup. The brown sugar maintains more of a molasses character than a white sugar and makes it richer in flavor. Want to be cocktail ready in no time? The secret is making a double batch of the Brown Sugar Simple Syrup. After it cools, pour it into a mason jar and keep it in the fridge. 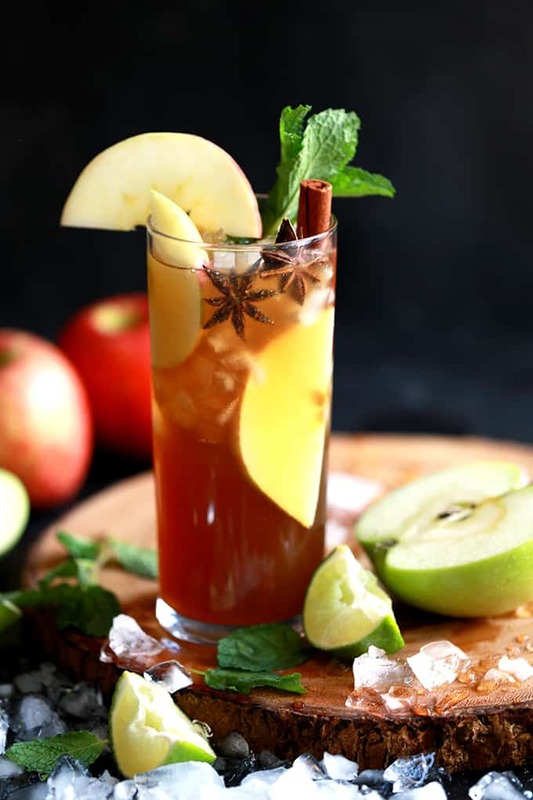 The syrup keeps for up to four weeks in the fridge which means that an Apple Cider Mojito is just minutes away. 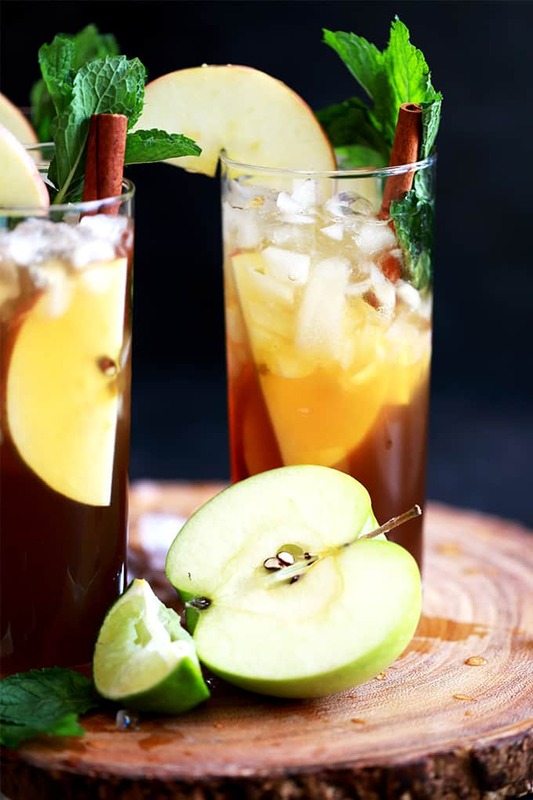 Grab your cocktail shaker because this Apple Cider Mojito recipe is about to go down. First you’ll add a half of lime. Cut it into wedges to make things a bit easier. Next goes in the fresh mint. See, I told you those plants I had outside were going to come in handy! You’ll then use your muddler – or the handle of a wooden spoon if you don’t have one – to extract the juice from the lime and bruise the mint leaves. Pour in the apple cider, rum and Brown Sugar Simple Syrup and add a handful of ice. Then it’s time to take out your aggressions on why your four children didn’t complete their chores again today. Or you know, whatever your stress happens to be. After a quick shake, shake, shake, you’ll stain the liquid and pour over ice and top with club soda. And then, the super fun part! 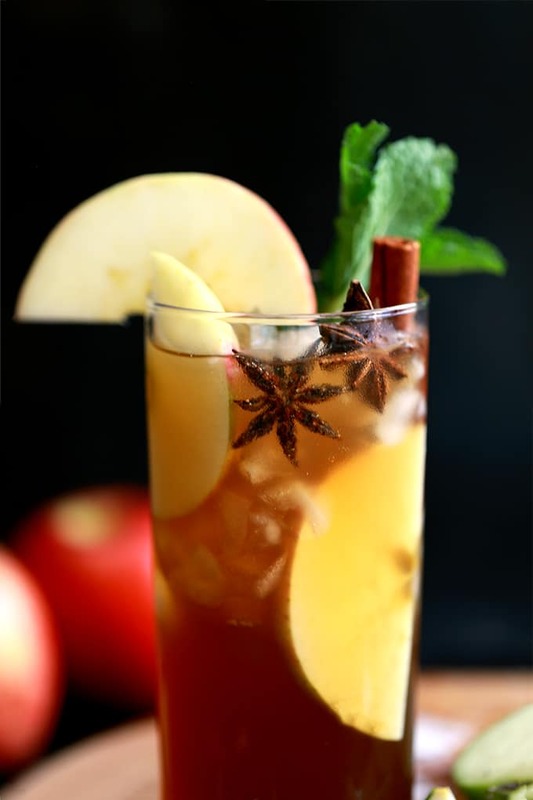 Garnish it up with apple slices, more mint, a cinnamon stick and if you’re feeling fancy, star anise. Cheers, friends! Having friends over or serving drinks to a crowd? No problem! This recipe is easily to multiply. If I am wanting to make several cocktails at once, I typically quadruple the recipe and prepare it in a glass pitcher. You’ll follow the same recipe directions, but instead of adding everything to a cocktail shaker, you’ll add it to the pitcher. You’ll also skip the shaking and instead stir everything together. There is absolutely no reason why this Apple Cider Mojito should work. None. Mint and apple cider? I mean, what rational mind thinks that they're a perfect marriage? Me neither. But rest assured, they absolutely do. It's like a caramel apple in cocktail form. And I'm betting the reason it works so well is my Brown Sugar Simple Syrup. In a small sauce pan over medium heat, add water and bring to a boil. Remove from heat and stir in brown sugar until completely combined. Simple syrup mixture can be stored in the fridge for up to a month. Add limes and mint to cocktail shaker. Using a muddler, extract juice from limes and bruise the mint leaves. Add apple cider, Brown Sugar Simple Syurp and rum as well as a handful of ice. Cover cocktail shaker and shake until well combined. 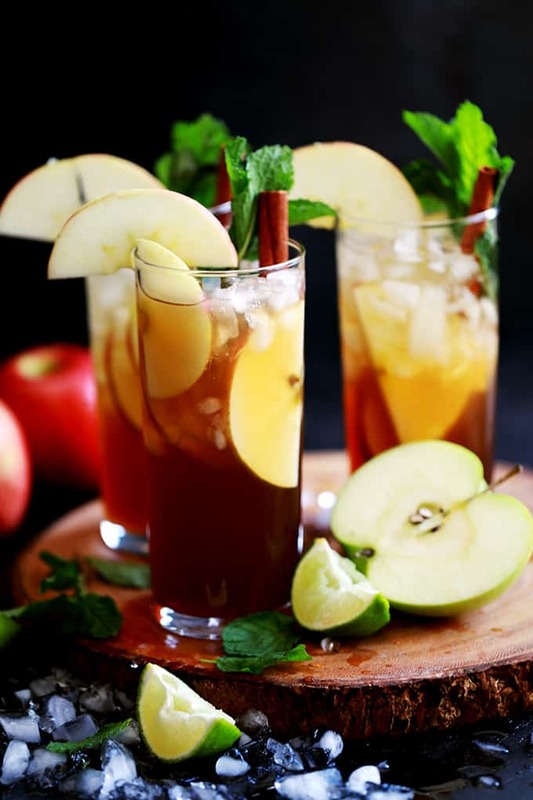 Garnish with fresh mint, apple slices, cinnamon stick and star anise, if desired. 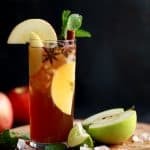 I used store bought apple cider for this Apple Cider Mojito but you definitely could use this Slow Cooker Apple Cider as well. Any leftover cider can be used in this Creamy Apple Cider Vinaigrette recipe or these Slow Cooker Apple Cider Maple Meatballs. One of these is 1240 Calories? Hey, Buzz - The calories aren't correct as it includes ALL of the simple sugar that you've made while you're only using 1/4 cup in the actual recipe. Can't wait to hear what you think, Des! This is my kind of mojito! I love that you made it Fall-flavored! It's my new go-to fall cocktail! What a fabulous drink! Great to try this weekend! I need to deliver one straight to your doorstep! I am going to have to make a pitcher of this! I highly recommend doing just that! Mojitos are one of my summer go to treats. THIS is going to be my go to fall drink. It definitely has become mine!